Home 2017 Races Which New Virginia Democratic Delegates Are Most Popular on Twitter? Which New Virginia Democratic Delegates Are Most Popular on Twitter? 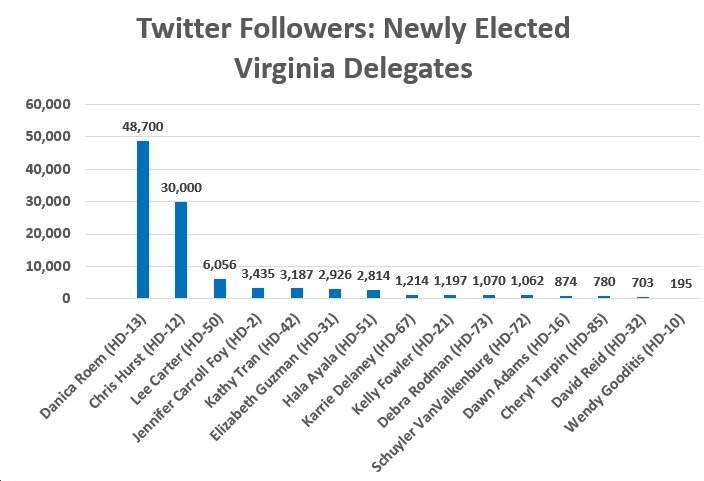 Of the 15 newly elected Virginia Democratic Delegates, which have the most followers on Twitter? See below for a list, with links to the delegate-elects’ Twitter pages (I encourage you to follow them! ), in descending order of Twitter popularity. I’ve also graphed this for your viewing convenience. For comparison purposes, note that Gov. McAuliffe has 122k Twitter followers; Gov.-elect Ralph Northam has 65.1k; AG Mark Herring has 28.6k; Lt. Gov-elect Justin Fairfax has 18.7k; House Democratic Caucus Chair Charniele Herring has 5,577; House Democratic Leader Del. David Toscano has 4,183; House Democratic Whip Del. Alfonso Lopez has 3,585; House GOP Caucus Chair Del. Tim Hugo has 3,568; and self-proclaimed “Speaker Designee” Del. Kirk Cox (R) has 2,268. Finally, Blue Virginia has 6,258 followers…let’s see if we can get that up to 10,000+ in 2018. P.S. I’m not seeing any particular correlation between how many Twitter followers these folks have and how well they did on November 7. Next articleWhat Is the Benefit – If Any – To Society of Having Disenfranchised Ex-Felons?